On March 9, four representative cases were chosen as the first to be tried in a series of bellwether trials regarding Sanofi-Aventis’s Taxotere (docetaxel). The drug manufacturer currently faces over 5,600 product liability cases alleging that the drug, prescribed for treatment of breast cancer, causes permanent hair loss (alopecia). The cases further claim that Sanofi-Aventis knew of the possibility of permanent hair loss and failed to warn patients and the medical community. One of the four will be picked as the first Taxotere bellwether trial, which is slated to start on September 24. The selected bellwether cases include complaints brought by Antoinette Darden, Tanya Francis, Barbara Earnest, and Lisa Tuyes. All reside in Louisiana. Ms. Durden’s claim is the lead selection. Her case alleges that she received a diagnosis of breast cancer in June 2011, and from October 2011 until February 2012, had six rounds of Taxotere treatment. Her suit claims that these treatments caused permanent and disfiguring loss of her hair. Bellwether trials are held to help judge how juries respond to evidence and testimony that is likely to be substantially similar across all the cases. Because the questions of fact and law in these claims across the country are broadly similar, the litigation is currently consolidated before U.S. District Judge Kurt Engelhardt in the Eastern District of Louisiana, as part of a federal Multidistrict Litigation (MDL). Hair loss is known to happen with chemotherapy treatment. The plaintiffs claim that other treatments that are equally effective exist, though, which do not cause permanent hair loss. They allege that they would not have chosen to take Taxotere had they known of the permanent hair loss risks. The plaintiffs point out that studies found Taxotere to be associated with permanent hair loss in 2005. Ten percent of patients receiving Taxotere treatment lost their hair, and the loss lasted longer than 10 years after chemotherapy. Taxotere carried warnings about the risk of permanent hair loss in several other countries, but this warning was not offered in the U.S. If the first bellwether does not resolve the Taxotere cases, the court has set a series of additional trials for 2019, on January 28, April 8, July 15, and November 4. Taxotere, a high potency taxane-based treatment for cancer, was launched in 1996 as a better alternative to low-potency taxanes like Taxol. 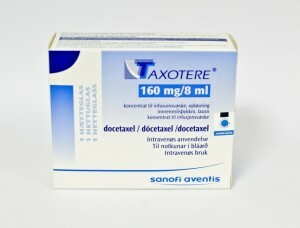 The suits against Sanofi-Aventis maintain that Taxotere is not more effective at treating breast cancer, but carries a higher risk of permanent hair loss. These risks are not associated with the low-potency taxanes.